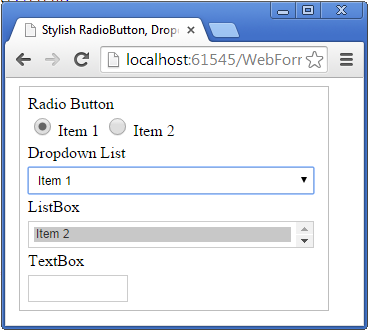 This article will show you how you can create a stylish and change the style sheet of radiobutton, textbox, dropdownlist and listbox controls in asp.net using css style sheet. Some of my previous articles are as follows: Dynamic Css Menu Creation Up to Three Level in Asp.Net Using C#.Net, jQuery DatePicker Calendar With Dropdown Month and Year in Asp.Net, Dynamic Css Menu Creation in Asp.Net Using C#.Net, Login Form With LightbBox Effect in Asp.Net, Highlight GridView Row on Mouseover Using CSS in Asp.Net C#.Net. So for this article first we will create a new asp.net application and add the radiobutton, textbox, dropdownlist and listbox control in your page after adding controls your page will look as shown below. 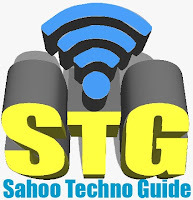 Now we will add a style sheet in our page. Add the below css style in style sheet page.